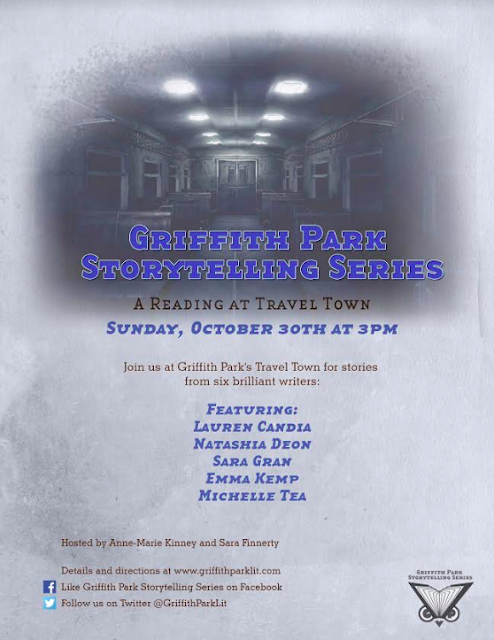 The reading will take place in a train car in Griffith Park's Travel Town. The address is 5200 Zoo Drive. Admission to the museum is FREE. Park in the parking lot and walk right in. Once you are down the staircase, directly in front of you you will see old train cars. Walk straight ahead towards the cars and we will be in the largest one. We will have a sign at the entrance of the train car. Lauren Candia is the co-creator and curator of Shades & Shadows. The Los Angeles-based literary nonprofit features six authors of speculative fiction every other month at a live reading series which is recorded for the podcast. By day, she is a not-so-very-scary-at-all library professional. Her passions are figuring out ways to make library services and programs more inclusive. She is currently developing programs for youth that foster creativity and self-confidence. She writes weird stories with a tiny dog on her desk. Her writing can be found in the East Jasmine Review, the Los Angeles Times, xoJane, and the Winter Horror Days anthology. You can find her on most social media platforms @Paranormalauren. Sara Gran is the author of five novels, including the CLAIRE DeWITT series. Emma Kemp is an artist and writer based in Los Angeles. She is one half of collaborative duo Earl Gravy, whose videos and installations have been exhibited in motels, hotels, and the Tate Modern, London. She is working on her first book, a parafunctional biography of musical artist Conor Oberst, to be published by Penguin Random House in 2018. Emma currently teaches at Otis College of Art and Design. Michelle Tea's latest book is the speculative memoir Black Wave.